Happy Wednesday! I am linking up with Ideas by Jivey for her Workshop Wednesday Linky Party. 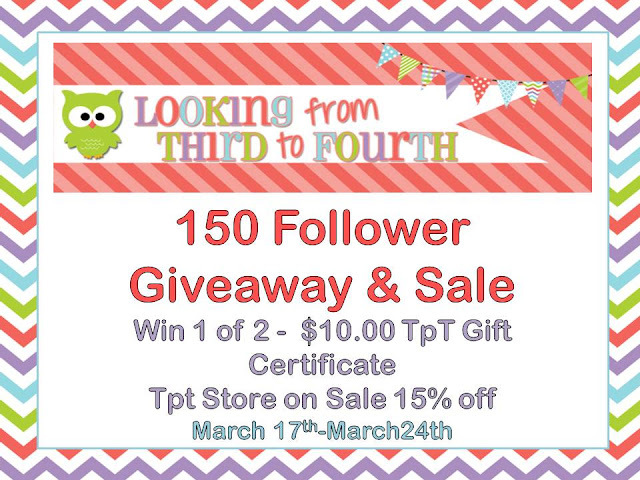 Be sure to head to her blog to read her post and pick up her freebies. This week's theme is Reading Workshop Graphic Organizers. 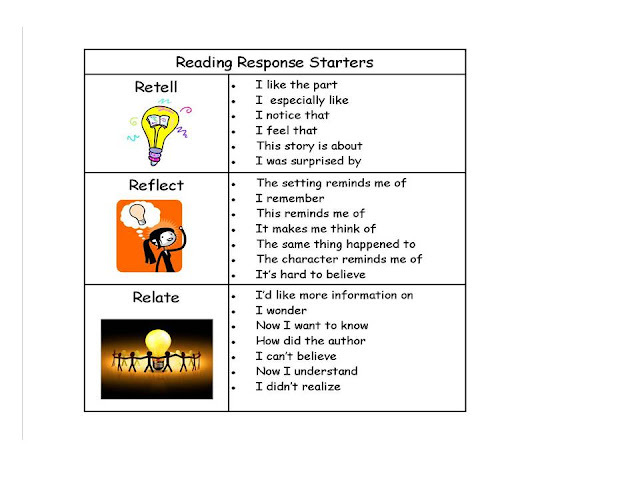 I am going to start by sharing something that is not a graphic organizer - but something I use during Reading Workshop and might help others - like a graphic organizer would (why I can never just follow a linky's theme I do not know). These are fiction and non-fiction reading response sentence starters that I have my students glue into their reading notebooks in September. They are very generic and do not remind the student to cite evidence BUT they have saved me on more than one occasion. Having them in their notebooks right from the beginning and doing a few quick lessons in which we write reading response sentences (in which they are taught they must give a reason) using them allows me to pull them out during emergencies (sub plans, when there is a last minute schedule change or *gasp* when I am stuck and need something quick to fill in time). I have also used them for home reading - reading response journals. I usually tell them to select one from each category. Now I will share an actual graphic organizer! This is one I use during non-fiction units (obviously!). It is included in my Non-Fiction Text Features Unit. 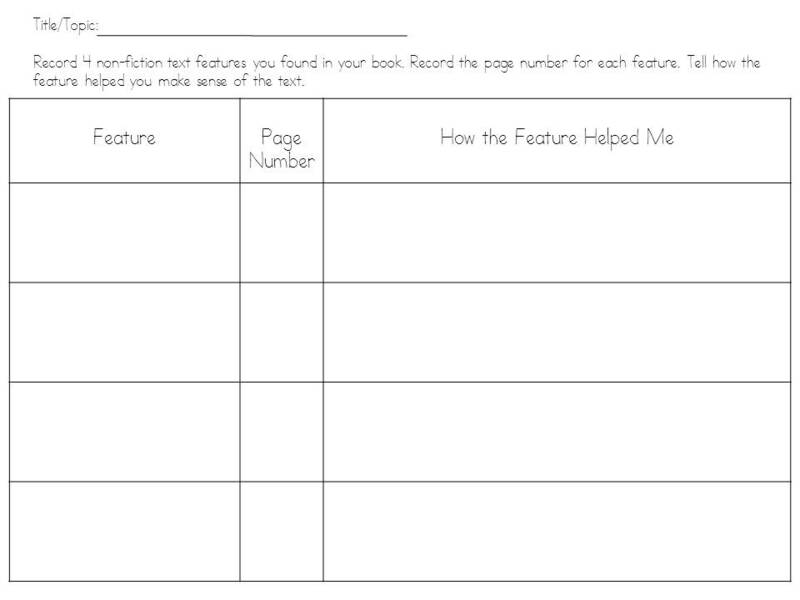 I focus on not just identifying features but focus on why the author uses them and how they help the reader. This year for our unit wrap-up we did a fun little activity that came to me while using this organizer. 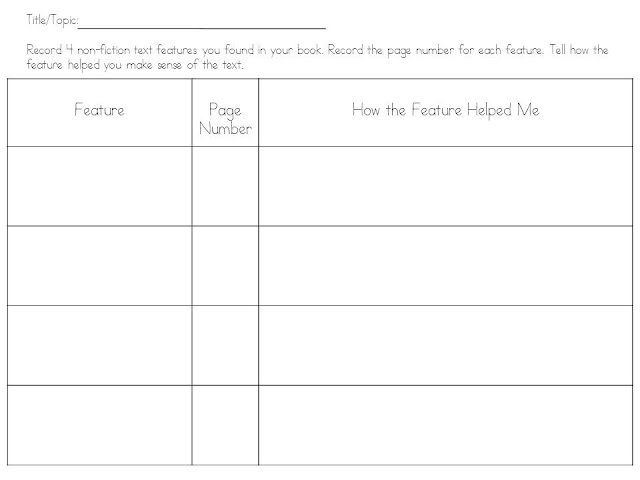 I have tried doing the non-fiction feature booklet - but it usually takes a long time and sometimes becomes hard to manage/assess. *recorded every feature in their guided reading books (I have four reading groups). *they had to make sure it was based on fact!! It was a fun way to wrap up the unit - I wish I had pictures of some of their features to share - some students did a great job! While you are here you might as well enter my giveaway! Click on the picture to head to the giveaway! Love the Response Starters! Often times my kiddos can't think of things to write or how to start. Thanks for sharing! 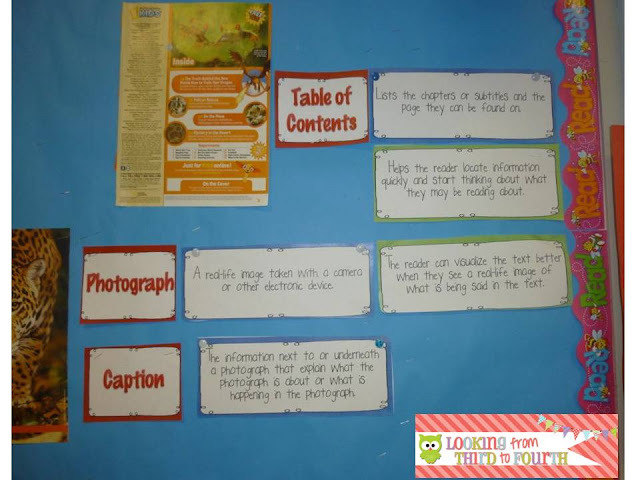 Great idea about having them come up with their own text feature to add to the book. I will definitely be adding that to my lessons on text features! Thanks for sharing! I love using response starters with my kids. Thanks so much for sharing. What great freebies - thanks for sharing! I love the response starters - what a great way to guide students and prompt them towards meaningful thought and discussions. All of these ideas are things I think will really be great additions to my reading workshop! I love the idea of creating a text feature - never even thought about doing something like that! I hope to share pics of their work, the planning template and assessment rubric soon. Thank you for sharing your starters! I love them and will use them for sure!